This application may be used for ALL FOOD TRUCK VENDORS wishing to appear at ArtCon. Please be advised one partner non-profit will be selling small bagged popcorn and soda from the Neosho Civic Center concession stand. We do not feel this will adversely effect food truck sales because popcorn is a snack and you are selling an amazing meal! Yum! ArtCon is happening inside the Neosho Civic Center and we are shutting down Main Street for Food Trucks to set up on directly in front of the building. ArtCon attendees will be encouraged to hang out and allowed to enjoy their food truck food inside, enjoy the event, and maybe some more food! This is a family friendly event! All applications due by noon January 5, 2019 for committee review. All accepted Food Trucks will have til January 10, 2019 to pay vendor fee. Acceptance is NOT guaranteed until approval of application is sent from Neosho Arts Council. Booth fee is $150 and paid after application acceptance. Set up will be Saturday February 9, 2019 from 8:00am to 10:30am. Neosho Arts Council will limit the number of similar food trucks allowed. We want to insure a variety of quality food vendors for ArtCon. We want your truck to be as unique as possible! Home canned or jarred items are not permitted! All vendors should plan to have their booth open and staffed from 10:30 a.m. until 7:00 p.m. on February 9, 2019 on Main Street in front of the Neosho Civic Center. Water will NOT be provided by Neosho Arts Council, City of Neosho, or area retailers. Vendors should plan to provide their own water. Trucks must be unhitched from trailers and parked in public parking spaces by 10:30am. Each vendor is responsible for moving trash to the dumpster at the end of the night located behind Neosho Civic Center. Silent generators please! No power will be provided by City of Neosho or area retailers. (A) I WAIVE, RELEASE, AND DISCHARGE from any and all liability, including but not limited to, liability arising from the negligence or fault of the entities or persons released, for my death, disability, personal injury, property damage, property theft, or actions of any kind which may hereafter occur to me including my traveling to and from this event, THE FOLLOWING ENTITIES OR PERSONS: Neosho Arts Council, City of Neosho, County of Newton, their directors, officers, employees, members, volunteers, sponsors, representatives, and agents, the activity or event holders, activity or event sponsors, activity or event volunteers. 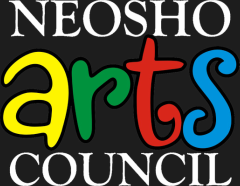 I acknowledge that the Neosho Arts Council, City of Neosho, Newton County, and their directors, officers, volunteers, sponsors, representatives, and agents are NOT responsible for the errors, omissions, acts, or failures to act of any party or entity conducting a specific event or activity on behalf of the Neosho Arts Council. I acknowledge that this activity or event may involve a test of a person’s physical and mental limits and may carry with it the potential for death, serious injury, and property loss. The risks may include, but are not limited to, those caused by terrain, facilities, temperature, weather, condition of participants, equipment, vehicular traffic, actions of other people including, but not limited to, participants, volunteers, spectators, coaches, event officials, and event monitors, and/or producers of the event, and lack of hydration. These risks are not only inherent to participants, but are also present for volunteers. All applications due by noon January 5, 2019 for committee review. All accepted Food Trucks will have til January 10, 2019 to pay vendor fee. Notice of acceptance or wait list will be via email! By submitting the application, the undersigned acknowledges receiving, reading and fully understanding all of the included guidelines and regulations of the Neosho Arts Council’s ArtCon. I understand that submission of this application with the required documentation does not guarantee my admission to ArtCon. Neosho Arts Council, the City of Neosho, and affiliated venues, volunteers, and sponsors are NOT responsible for accidents or theft. I have read the rules, liability waivers, and media waivers provided above and agree to follow the rules as outlined including reporting all city and state sales taxes. I understand failure to follow the guidelines may result in denial of future opportunities or removal from Neosho Arts Council’s ArtCon. I am ready to bring yummy food to this fun event!